We are based in Newport South Wales and Flat roofing is about 75% of our business. 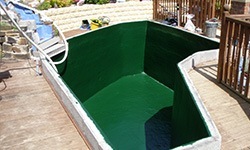 We also install Pond Lining, Gutter lining & Tank lining as well as offering many other on-site fibreglass applications. Our durable fibreglass systems can be applied to new or old buildings, providing a permanent, one piece, watertight finish, and are produced from the highest quality materials. They are completely seamless - even in such areas as outlets, skylights and other protrusions. Fibreglass has excellent performance under all climatic conditions and is suitable for flat roof extensions, dormer windows and balconies (foot traffic is no problem!) 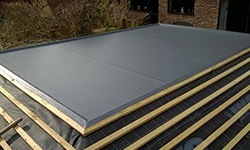 Also, unlike most flat roofs, this system is very strong, versatile, maintenance free and aesthetically pleasing. With over 30 years experience, we know how to complete a fibreglass roof to last a lifetime. GRP (Glass Reinforced Plastic) is another name for fibreglass or glass fibre and is a mixture of polyester resin and glass chopped strands. These glass fibres come on a large roll, which is cut to size and impregnated into the resin for reinforcement. The reinforcement matt comes in different thicknesses measured in weight. A lot of companies only use 450gm/mtr.sq, but we like to use between 600gm/mtr.sq and up to 900gm/mtr.sq, depending on the application and requirement of each flat roof, pond lining, wet room, etc. When the resin has cured we apply a pigmented polyester formula topcoat to all the laminated surfaces; this gives the roof a smooth impervious finish. This "flocoat" can be any colour and contains a wax solution which repels water and helps prevent algae build up. A non slip additive can also introduced at this stage if needed. This can be also be used for wet rooms! Pond Lining and other GRP projects fill the other 25% of our time, energy and skills, producing quality products specifically meeting the clients requirements, in many fields of work and design. We offer a full service in anything that could be made with Glass Reinforced Plastic (G.R.P). If you have an idea and want to proceed with it, from flat roofing to bespoke Stage Props, Koi carp Pond Lining to Tank Lining, glass fibre could be the answer. All our work, be it flat roofing, pond lining or valley gutter lining, is carried out by ourselves; we never use contractors. Fibreglass flat roofing, pond lining or any of the services we offer should never be attempted if the surface is damp or if there is any chance of rain. Contractors can't be trusted to follow this rule, we can, and we want your Fibreglass to last a lifetime. 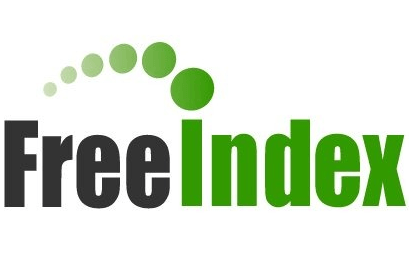 We always endeavour to maintain a professional yet friendly service, whether dealing with a client, supplying a quote or simply providing information. We are not a large company and can offer you a "Truly Great Service with Quality as Standard" All our roofing carries an Insurance backed Guarantee. If you have a Flat roofing project in South Wales or a need for Pond lining in South Wales. We will complete any fibreglass project to the highest standard, whether domestic or commercial. Please contact us; distance is no problem. We cover Newport, Cardiff, Monmouth, Abergavenny, Brecon, Lydney and Chepstow; all of South Wales and much further afield. We do Flat Roofing in Cardiff, Flat Roofing in Brecon, and Flat Roofing, Pond Lining & Gutter Lining in Chepstow; Roofing in Newport, Roofing in Monmouth and Roofing in Abergavenny; GRP in South Wales and Fibreglass Flat roofing in Newport, South Wales and all the surrounding areas of Newport.